performance. We do this by tuning the AppModule or the View Objects. When tuning the Application Module, you need to have in mind the estimated number of concurrent users. In this example we suppose this number is 75. In order to optimize data loading, we need to tune all View objects used to display UI tables, lists or LOVs. For example, this view is used to display ADF table with scrollPolicy=”page” and iterator range size of 20 rows. 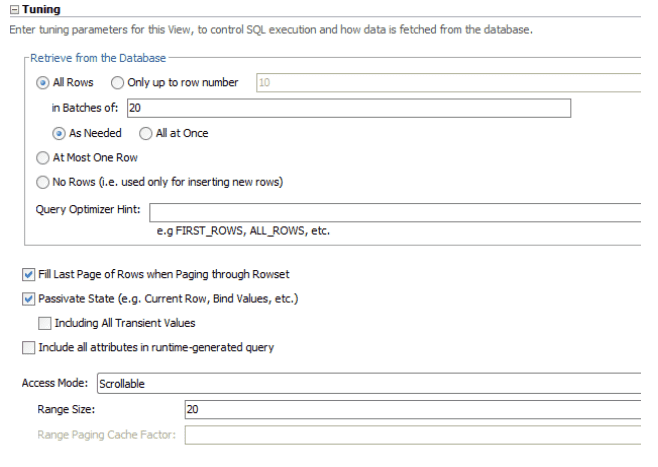 With the following setup the View will fetch 20 rows at once from the database and load the page iterator with 20 rows at once. These best practices are taken from official Oracle documentation and also AndrejusBaranovski’s official blog. For further details on how to create stress test and additionally optimize the settings you can refer to: Stress Testing Oracle ADF BC Applications – Passivation and Activation. 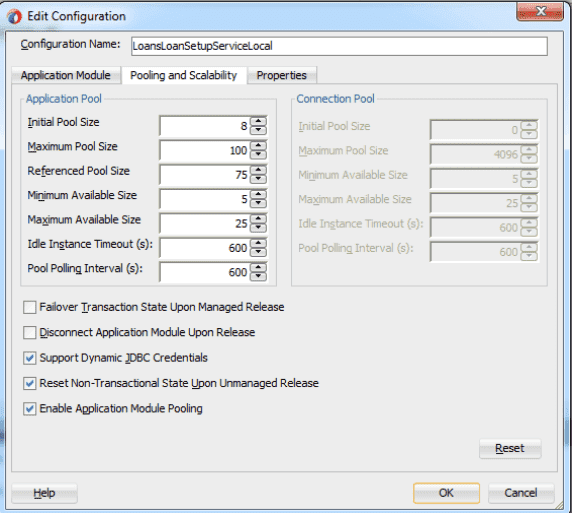 Can you please comment based on your production experience with ADF Application Module Pooling tunnings – how many users do you accommodate per Managed Server? How much RAM memory do you allocate per Managed Server? What is the maximum number of connections consumed per managed server? What is the maximum number of application module instances in the pool, per managed server? Florin, thanks for your post. The questions are indeed relevant. Todor will answer at the first opportunity. Do you work with ADF or you are Oracle enthusiast? Please add Datasource defined in weblogic server tuning parameter info as well. Or let is know how many number of connection you have defined in Datasource and what is Inactive Connection Timeout value. Hi Florin and Kiran and thank you for your kind questions. I will skip the part saying every tuning may vary greatly and depends on the application architecutre – e.g. number of AppModules, usage of shared AppModule instances, size of BOs and fetches or weather you store objects in session or other scopes. We’ve seen different space allocation based on GarbageCollection policy and type of JVM (Jrockit or Hotspot) as well. At the current implementation we have 2 managed servers that our Weblogic administration team setuped. On each of these we have 1 ADF application with allocated memory of 3GB and 2GB respectively. The bigger one has caching of objects in the application scope (SAP reports and excel sheets) that are kept for parsing, thus taking bit more extra space. The way we determine what size of DatasourceConnection is via load test. Our DevOps guys make JMeter test (Andreus Baranovski has outlined the process quite well) and then execute the test with the expected number of concurrent users. Next they check what was the maximum number of Datasource connections during the stress test (let’s say 100). This number is set as an minimum capacity and 150 will be set as maximum capacity. I would always recommend to put a valid maximum capacity, since you want to get notified when you reach the limit and check if there are any stuck connections or other problems. About inactive connection timeout – the recommendations that we follow is your Session Timeout + several seconds. The idea behind this is to release the connections once a user session has expired. How many users do you accommodate per Managed Server? I am interested on your production experiences alone. Do you have this numbers?